Double Stack Vegan Bean and Mexican Crumbles Tostada and a GIVEAWAY! 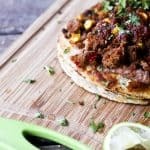 Double Stack Vegan Bean and Mexican Crumbles Tostadas and a GIVEAWAY! …My youngest three kids. The pickle-in-the-middle, our third born, is slowly emerging from his potato-pea-and-corn-only vegetable cocoon, having recently decided that herbs are alright and onions-–so long as he couldn’t recognize them in a dish–were okay. Our fourth born has embraced the wonderful world of salad lately, just so long as it is swimming in Ranch dressing. Our fifth born is the hold out. That little fellow won’t touch a vegetable knowingly. Paradoxically, he’s pretty keen on eating clover plants from our yard. I certainly won’t be the one to tell him it’s technically greenery he’s ingesting. By some miracle, I discovered that these guys ALL like Wildwood Hi-Protein SprouTofu in dishes. The happiness this gives me cannot be overstated. I adore Wildwood’s motto of being rooted in the healthy trend of not following trends. Preach it, folks! I can toss a piece of tofu into a smoothie to boost the protein. I can crumble tofu into Mapo Dofu (recipe coming soon). And while it’s their tofu that drew me into Wildwood, I have to confess that I’m pretty much wild over their Original Veggie Burgers and Meatless Crumbles. I love that I can feed them to my gluten-free, vegetarian nieces and nephew. It’s pretty awesome to be the fun aunt serving tostadas covered with refried beans and the Meatless Crumbles Mexican Inspired. People. My avowed anti-vegetable kid devours these tostadas. WIN! Double Stack Vegan Bean and Mexican Crumbles ostada and a GIVEAWAY! Quickly char the tortillas over a bare flame on the stovetop. If you don’t have a gas range, broil them quickly to char both sides slightly. Add the teaspoon of oil to a heavy-bottomed pan and swirl to coat. Add as many tortillas as you can fit in the pan, fry until golden brown and crispy on both sides. Transfer to a paper towel lined plate. Add more oil if necessary and repeat with the remaining tortillas. When the tortillas are all crisped, add the package of Wildwood Meatless Crumbles, Mexican Inspired, to the pan and heat according to package directions. 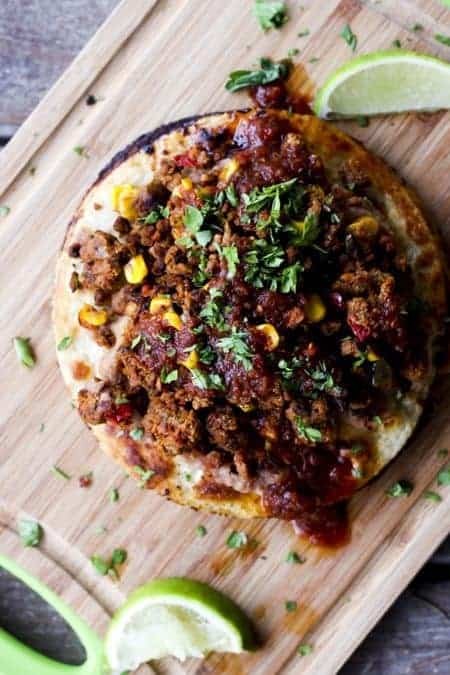 To assemble the tostadas, lay one tortilla on a plate, top with 1/6 of the refried beans and 1/6 of the crumbles, add another tortilla, repeat the layers and finish with a drizzle of salsa and a shower of chopped fresh cilantro or parsley. Are you interested in Wildwood products? Please visit their site to learn more about their mission, philosophy, and products! This sweepstakes runs from 10/1/2013-10/31/2013. Be sure to visit the Wildwood brand page on BlogHer.com where you can read other bloggers’ reviews and find more chances to win! We LOVE making enchiladas with soy crumbles. As a vegetarian living with 2 carnivores, this dish makes us all happy! I think she was using carnivore as a literary device. Let’s not worry. Broccoli Peanut Butter Tofu stir fry with Wildwood SprouTofu. I’ve never used any “meat substitutes” but this looks amazing! I’d love to try this. I’m looking for them the next time I go grocery shopping! Um, I would make THIS RECIPE, of course!! This recipe looks amazing, and after looking at the Wildwood website, I would definitely make this and a big pile of pad thai using the gluten-free noodles and royal thai flavored tofu! It all sounds so delish. With the weather getting cooler, I would totally make a chili with their meatless crumbles and make it a little extra special by adding their 3-bean dip! I used to buy the marinated tofu all the time when I lived in California. I haven’t seen it since we moved to Colorado, but by visiting the website figured out that I can get it here, too! Hopefully the teriyaki tofu will be in stock when I shop this weekend. So excited to find this again! I would like to try the Wildwood Original Meatless Meatballs and I would make spaghetti and meatballs for my family. My kids like basic meals, so this would be great. I would use the meatless crumbles in a Taco Soup. These tostadas look amazing. I would use them in this and other recipes to win a weight loss challenge I am in. the tomato and herbs angel hair pasta looks amazing!! i would like to try it with smoked sausage and sprinkled with parmesean!! I think they’d be great in lasagne ! Love the nutritional yeast (nooch) shout out! I love an extra firm (or Wildwood’s super firm) tofu sliced thinly, coated in nooch, salt and lots of black pepper then pan fried on both sides until crispy. It’s great on sandwiches with some vegan mayo and pickles or pesto! My ideal dinner recipe would be spicy homemade chili and tofu with rice on the side. Ooh, definitely nachos! With lots of salsa and avocado chunks and cilantro on top! My husband and I will sometimes just make a giant baking sheet of nachos and sit around munching for our dinner. The Wildwood Mexican crumbles would be a great addition. I would keep meatballs and pasta in the freezer for last minute emergency dinners. I haven’t been able to do that since we had to go gluten and dairy free. I would use the silken tofu to make homemade mapo tofu. Lots of things to choose from though! Mine would probably be some type of Thai dish or tempura tofu. 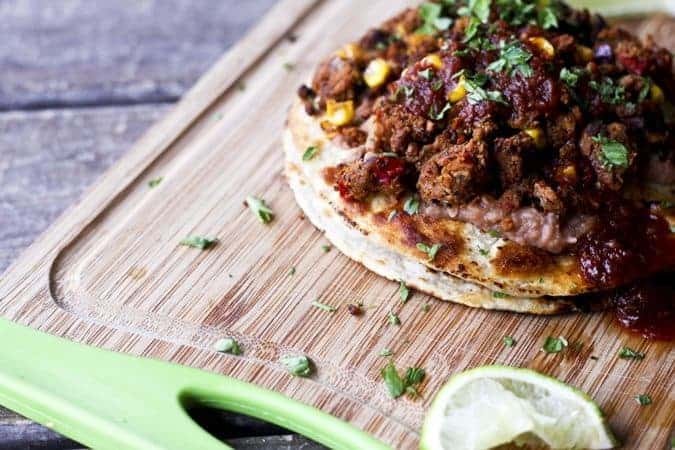 I would love to try this recipe, for the double stack vegan bean and Mexican crumbles tostadas, and also their wheat free pastas. I’d love to make the recipe posted – Double-stack Vegan Bean and Mexican Crumbles, but I’d also make the Bleu Cheese Burger recipe on the Wildwood site. I would love to use the meatless crumbles to make either quesadillas (love!) or enchiladas. I would love to try this recipe! A meat substitute lasagna would also be a hit in our house. I’d use their Wildwood® Original Meatless Meatballs in a meatball sub. I would love to try the Greek Olive and Garlic Hummus. It sounds great! I would like to try the crumbles to make the tostadas and also veggie sloppy joe sandwiches. We have been out of luck to find a brand of veggie crumbles that are also gluten-free, so this will be fun trying them out! I’ve read some of their products are not GF–do you know which ones? Silken tofu = Mooless Chocolate Pie! I’ll be interested to try some of their other ‘meat alternatives’. I tried those types of products in the late 80s and they pretty much all gave me heartburn. But, we’re trying to eat less meat, so a new brand to try should get a spin. Since I am lactose intolerant, I would love to try their soymilk. Then I could have my cookies & milk! Those look so freaking good I want to scream. I think chili would be awesome! I would like to use their products to make chili! I really love pad thai. https://mobile.twitter.com/birdmoose3/status I tweeted, but this comment thing keeps telling me my comment failed?!? This recipe looks fabulous! Something I can do in two pans, one for my vegatarians and one for my carnivores! Thanks! I’d love to make chili with the meatless crumbles. The super firm tofu looks incredible in their Tikka Masala recipe! I’m not good at making my own recipes, but I could try making this tostada with Wildwood products. I’ve suggested to my husband we try and go meatless one day a week but it doesn’t fly with him…..I think this would be a great introduction for him! I think I would make spaghetti sauce. I would make a brunch frittata with the crumbles. Wow this looks great! I’m thinking those Southwest Veggie Burgers are pretty fantastic… add some sliced avocado and maybe a chile mayo and I’m a happy camper. Chili! I like to sneak in TVP chunks but the family knows it right away. I’ll bet they’ll like this much better. I think that the tofu tikka masala from their website looks pretty amazing. I would like to try the crumbles and make my sloppy joes. The kids always love those. My ideal dinner recipe when using Wildwood products would be Tofu Tikka Masala served with rice – yum! My ideal dinner recipe would be one that is simple and easy – sauteing this up in a pan with veggies. Well I’m not the most skilled cook, so my ideal dinner would be something simple that all three kids would eat- wildwood® original meatless meatballs in a meatball sub fits the bill! I think I would use the Wildwood Italian-Styles Meatless Crumbles to make a casserole of some kind. I would make this dish that was posted. Looks absolutely yummy! I’d use their Spinach Fettuccini noodles to make a tasty tomato and herb pasta dish. Lasagne. mmm. Although the posted recipe looks amazing as well! I’d like to make a meat sauce using Wildwood Meatless Crumbles and serve it over their Tomato and Herb Angel Hair pasta. Thanks! I’d take the Wildwood® Original Meatless Meatballs and make a meatball sub. Love the meatless crumbles – it makes the best taco filling ever! I’d like to try Wildwood Meatless Crumbles, Mexican Inspired in my tacos. I would love to try the spinach noodles with baby patty pan squash and snow peas sautéed in garlic and coconut oil. My ideal dinner recipe would be lemon rosemary tofu with a big kale salad. I’d take the Wildwood® Original Meatless Meatballs and make spaghetti and meatballs. Enchiladas Spanish rice & fried ice cream -oh you! Mine would be spaghetties or ravioli, yum! I’d like to make Peanut Noodles with the Tomato & Herbs Angel Hair (the dish uses ginger, sesame oil, green onions, peanut butter, soy sauce, and of course, noodles). I would use Sproutofu super firm to make miso soup. I am greek and vegan so its hard at times to do the perfect meal. But I am all about Wildwood Humus! I love the Greek Olive and Garlic and the Roasted pepper as well.! I make the perfect meze platter with both surrounded by kalmata olives, roasted peppers, eggplant and zucchini. I make homemade pita chips and we have a quick light meal! I make an easy quick dinner with wildwood spinach fettuccini and their Italian flavored meatless crumbles. Add a can of organic diced tomatoes and some fresh basil….. DIVINE! I am interested in wild woods products. They make the only soy milk I’ll drink and delicious veggie tofu burgers. Their soy milk helped get my mom off milk! i would make a rich, wildwood meatless crumble chili pie! Would love to make spaghetti & meatballs with a spaghetti squash and Wildwood meatless meatballs. I’d use the “meatballs” in my favorite spaghetti sauce. Thanks! I’d make spaghetti and meatless meatballs. I’d use meatless meatballs – I can use my fave sweet and sour sauce with them and serve over rice with grilled pineapple. That’s easy, it would be a stir-fry with extra-firm tofu, pineapple, and red and green peppers over brown rice. And all three of my young ‘uns plus my husband would eat it. A cookout with their veggie burgers would be great! I’d like to try the Southwest Veggie Burger for a cook out sometime. I would love to use the Roasted Red Pepper Hummus as a pre-dinner snack with some carrots, celery, broccoli, chips, etc. Can’t go wrong with hummus! It can also be part of the dinner too by being a spread for bread. I can’t wait to try this recipe. I love Mexican food and crumbles and am always looking for new recipes for both. I would love to use the Wildwood Slim Longnoodle pasta with my spaghetti and meatball recipe. I would want to try their hummus, and maybe mix in some of their salsa. Bean burritos- yum! I would use the Pasta Slim Tofu Spaghetti Noodles to make Spaghetti since that’s one of our favorite dishes! This recipe looks good. My son loves tostadas anytime of the day. I would love to use the noodles with Bok Choy to make a delicious Soup!! I would love to make fish tacos with Wildwood/Emerald Valley Kitchen Organic Salsa. I’d use the meatless meatballs to make my favorite spaghetti & meatballs. My ideal dinner recipe using Wildwood product would be sweet and spicy tofu stir fry over rice. Probably a good stirfry or spaghetti! Wildwood® Original Meatless Meatballs in my hubby’s Swedish meatball recipe! I would make meatless lasagna! I would make Tofu Tikka Masala. Spaghetti Bolognese is what I would create.